One of my very favorite authors is Sophie Kinsella. The first book of hers I read was Confessions of a Shopaholic. My friend Kristen K. gave it to me. On the plane ride home, I was laughing so hard I was getting looks from the other passengers. I loved every minute of it. Good thing she wrote a whole series! 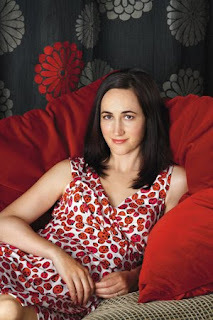 Let me introduce you to Sophie Kinsella! Madeleine Wickham (born 12 December 1969) is a bestselling British author under her pseudonym, Sophie Kinsella. Educated at New College, Oxford, she worked as a financial journalist before turning to fiction. She is best known for writing a popular series of chick-lit novels. The Shopaholic novels series focuses on the misadventures of Becky Bloomwood, a financial journalist who cannot manage her own finances. When she was five she decided that she was Scottish and took to wearing kilts every day and dancing reels around the house. Her new addiction is Cadbury's Giant Chocolate Buttons. She's always had a secret yearning to read the news on TV. Her latest fab purchase is a replica retro American payphone for her kitchen. She has never done a bungee jump and never plans to. Having my children has got to be top of my memory list: my three sons, Freddy, Hugo and Oscar. I have a mixture of very vivid memories — the births, the first sight of each newborn, that piercing little cry — and then lots of blurred memories: night feeds, the snuffling sound of a hungry baby, that fresh-bathed baby smell, the moses basket on the bed, flowers everywhere. These memories all seem to run into one another — the first weeks of a baby scramble your brain! Swimming in the sea. I adore the sea, and when I think of the perfect holiday moment, it's an afternoon in the south of France, years ago. I'd gone with a whole gang to an island off the coast near St Tropez. The sea was turquoise and the sun was shining and I can remember swimming around with my sister Gemma and feeling life was pretty much perfect. My first kiss. This has to be up there, just because it was so funny. I was walking across the common to my friends' house, aged thirteen. With no warning, my friend's brother just pulled me aside into some trees and kissed me. I can remember thinking "Ooh, we're kissing like they do on TV". Then we walked to his house and watched Star Wars, and neither of us ever mentioned it again. He went to the States for the summer and by the time he came back I had a boyfriend, so our love affair lasted approximately five minutes! Doing a backwards somersault. This is a strange one. The reason it's a top memory for me is that there's no WAY I could do a backwards somersault now - but I used to do gymnastics, and I did them all the time. So in my memory, I know what it's like to jump into the air, rotate confidently and land with a flourish. But sadly, only in my memory!! Love Sophies books, not read Twenties Girl yet though! This was adorable. I loved her memories. I just LOVE Sophie Kinsella! I love her SO much! Thanks for the feature! Sophie Kinsella is one of the few adult authors I absolutely love. I'm so excited that she's writing another Shopaholic book!